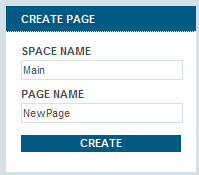 A user creates a new page using the NewPage Panel by entering the page name in the field and clicking on the Create button. A note is permanently displayed stating 'New pages are created in current space'. This behavior may be misleading, especially to novice users, since it is not always easy for users to determine the current space. In particular, the current space is not displayed in the NewPage Panel itself, so the user has to look around elsewhere in the interface to read this information. It would be better to explicitly display the current space name in the NewPage Panel interface. A more general interface would allow for choosing a space to create a new page in and maybe event to create a new space on the fly, maybe by a mechanism similar to the labels list in gmail.